10 Awesome Ponytail Hairstyles - One For EVERY Occasion! Depending on how you wear it, ponytails can make you look all cutesy, chic or elegant. And ponytail is one hairdo that looks good on absolutely any hair length. No wonder then, that we absolutely love this hairstyle, and it is our go-to when we want to flaunt some style while being comfy too. Here are 10 ponytail hairstyles that look amazing and are perfect for every occasion. 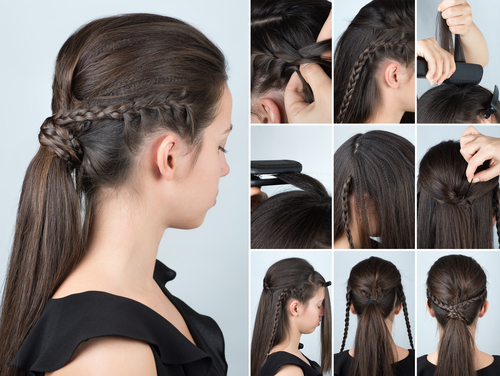 Each of these pony hairstyles are super easy to do, ladies! This classic ponytail hairstyle is the epitome of elegance. Part your hair in the centre and gather it neatly in a low ponytail. 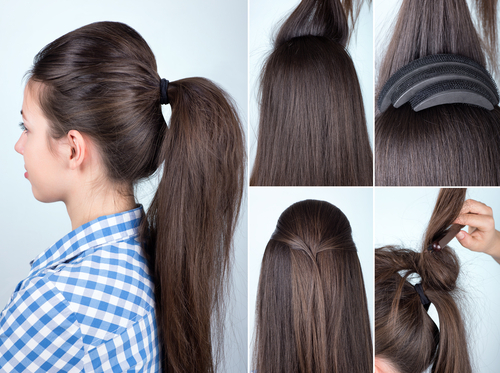 Use a section of your hair to wrap that pony so that the pony band doesn’t show. Do some back-combing in the crown area to add a bit of volume, and there, you have yourself a stunning hairstyle perfect for a night out or lunch with the girlies. How dreamy is this hairdo?! And ladies, it’s not as complicated as it looks. Part your hair in the centre, and divide the hair in front on each side, into two sections. Entwine these sections with each other and do this for the entire length of those strands. Then, use these two entwined sections on either side to tie your hair into a low ponytail. Isn’t that easy and so stunning? There’s something very glam about a super high ponytail. And it definitely is an attention grabber. For a formal occasion, go for a high ponytail and tease it a bit to add some volume. Place the ponytail over the shoulder on one side for that extra oomph. 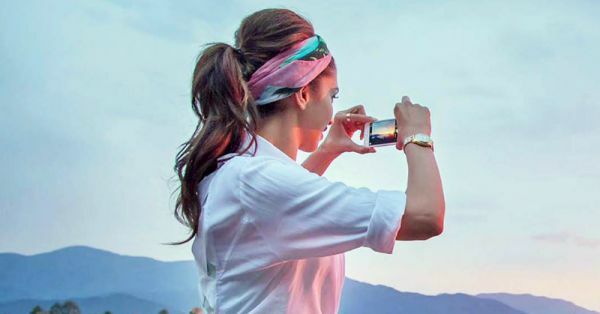 Isn’t this pony hairstyle of Alia’s just so adorable?! This back-to-school vibe is one we all love and one that will get you tons of compliments too. 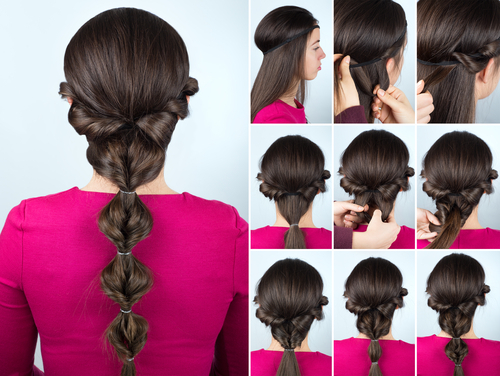 Use the hair in the top-middle section and collect that into a neat and tight ponytail. This time, it’s be better if you let the pony band show. Make sure that the rest of your hair is neatly combed out and rests on your shoulders. Hair that is twisted from the front and then placed in a ponytail as wonderful as this one - now who wouldn’t like that?! To make this a tad bit simple, use a rubber band to tie your ponytail at regular intervals. Tug at every section to add some volume to it, and you’re good to go. Bumpits are such a boon when you want to add volume and lots of drama to a hairdo. Place three of them - each one smaller in size than the one before it - on the crown of your head. Place the midsection of your hair over the bumpits and collect it all in a ponytail after. Tease the ponytail for oodles of volume. Try it ladies, and you’ll be so happy with your look! This diva knows style better than most of us do. A slicked back ponytail hairstyle with a deep centre parting is a foolproof way to look ultra chic for an evening get-together or just a day out at the mall. It’s easy to manage too! A loose, low ponytail hairstyle made with hair that is curled at the bottom - that’s one beautiful look! Create waves in the front section of your hair and leave some strands loose to frame your face. Bring your ponytail in front, over one shoulder and you’re done! Be it a date or a casual day with your girl gang - this one is a hairstyle that everyone will love on you. 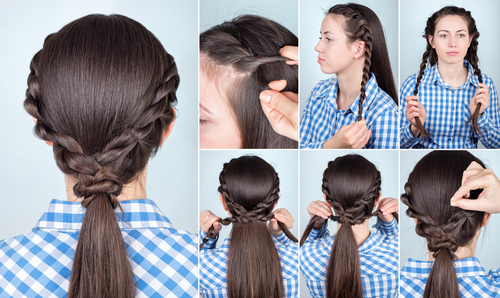 This easy-peasy hairdo entails making two fine braids above both your ears that are placed into a ponytail with all the rest of your hair. This hairdo is simple but with a cutesy twist that’ll make it stand out wherever you go. Also, don’t forget to wrap the braided sections over the pony band. Doesn’t it look like Jacqueline stepped right out of a fairytale? Make a deep side parting and collect all your hair on one side, below your ear. Use hairspray to tame any flyaways and for a neater look. 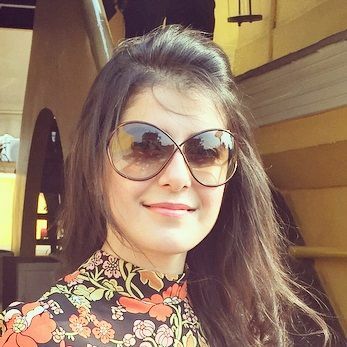 This hairdo will grab eyeballs no matter where you go, we promise!